A mapped summary of our most recent travels since the beginning of 2016. We’re nearly six weeks behind real time posts, and delays in our posts will likely continue. We simply haven’t been able to upload photos and videos in Malaysia and Indonesia. Internet connections are usually very slow and sometimes, just barely functional. We haven’t found anywhere (for weeks!) where we have enough upload speed for our growing collection of photos and videos. We experienced slow connections in Thailand, too, but managed to find one or two dependable locations with enough bandwidth (in hindsight, what a luxury!). Here are a few maps that show our recent travel. 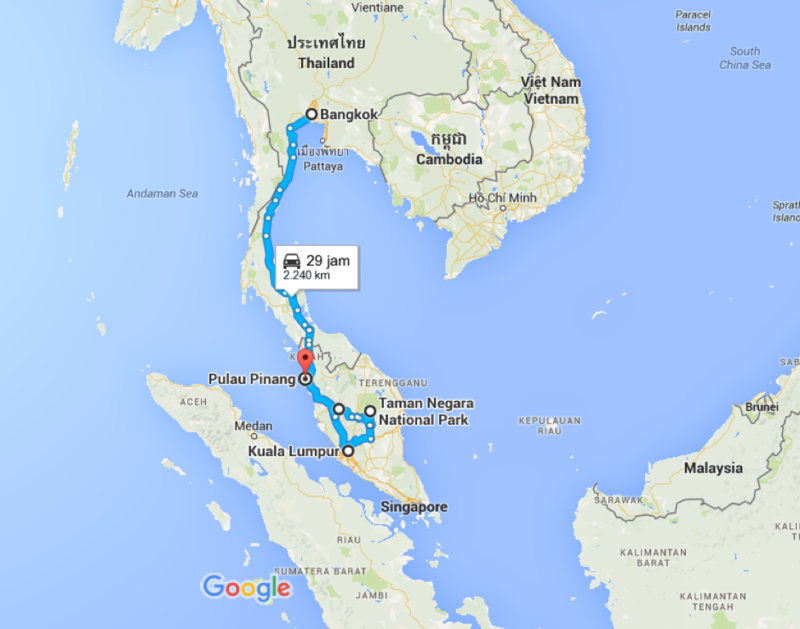 We left Bangkok at the start of the New Year, January 2016. We flew to Kuala Lumpur, Malaysia. Then, we took a minivan with a few other passengers to the Jetty in Kuala Tembeling where we boarded a small wood longboat-style river boat to Taman Negara, a 130 million year old rainforest and national park about 240km northeast of Kuala Lumpur. From there, we drove about 250km west, to Cameron Highlands, one of Malaysia’s most extensive hill stations, with blissfully cool temperatures and altitudes that ranged from 3,600ft to 5,200ft above sea level. After Cameron Highlands, we had a minivan to ourselves for the entire 260km drive to Pulau Pinang, an island that sits on the west coast of Malaysia in the Straits of Malacca within the Malaysian state of Penang. We spent most of our time in Georgetown, a UNESCO World Heritage site, one of the most commercially and economically developed cities in Malaysia, and a charming historic city all rolled into one. From Penang, we flew to Medan, Indonesia, the third largest city in the country. From Medan, we had a private car drive us the short 70km to Bukit Lawang, a small village adjacent to Gunung Leuser National Park. The park is part of the Tropical Rainforest Heritage of Sumatra which is part of a UNESCO World Heritage site. 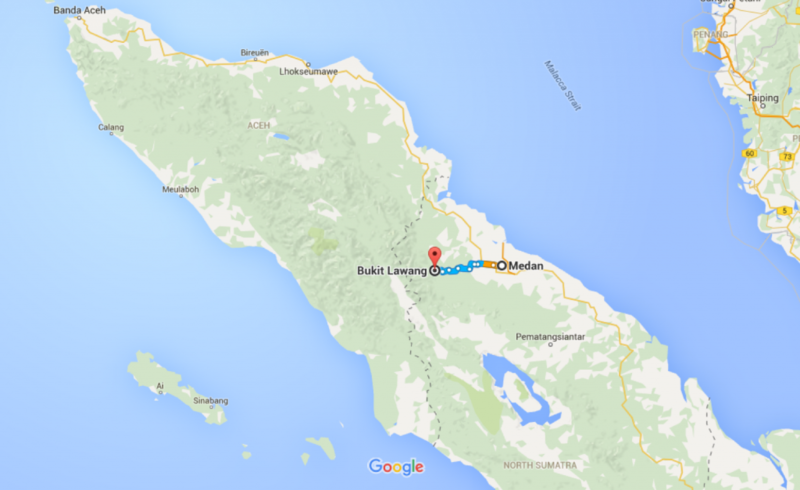 We are writing from Bukit Lawang now, and have departure plans tomorrow morning for Berastagi, known for cooler temperatures (yay! ), a couple of volcanoes and some hot springs. For scale, consider that “little” volcanic island (Samosir) you see sitting southeast of Bukit Lawang in the middle of a natural lake (Danau Toba/Lake Toba). 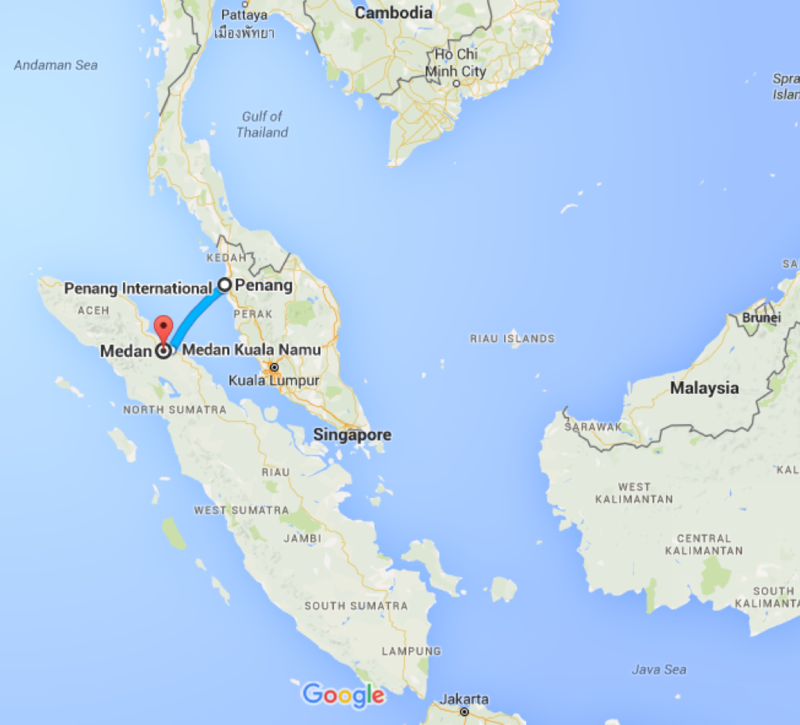 Samosir island is the size of Singapore. WOW! And to think, it is already February, 2016!!!! My, oh my, how time flies, eh? Jette, you are already 10 1/2 years old. And already you have personally experienced more countries, cities, towns, villages, waterways, mountains, rain forests, jungles, styles of cuisines, languages, currencies, styles of dress, religions, and cultures than most people will in their entire lifetimes. Proud of you, girl! Keep on trekking. We can hardly wait to be with you again so we can hear some of your stories. It’s been really cool to see everything around the world. Right now, we’re in Sumatra (Indonesia) and it’s really pretty, especially Lake Toba. I haven’t been swimming in the lake yet, but I’m planning on it. Can you guess what “Ayam Goreng” means? I’ll give you a hint: “Goreng” means “stir-fried”. We can’t wait to see you again when we get back. I miss you. Love, Jette. Oh my lovely Jette … Yummy! Yummy! We do love out fresh chicken, don’t we? Maybe tinted with a little “kuning”, eh?